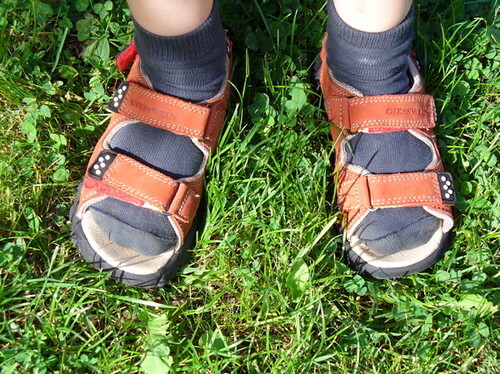 Well, you can’t really get it, until you know that last year my son wanted pink sandals – and I didn’t buy them. Later I was proved right because the other children made fun of him when he wore some pink socks that I had bought him instead. I was surprised when he chose the red sandals this year and declared that this was a color very suitable for a boy. They’re working with the manly black socks! Love the black socks with the sandals. He’s really making a fashion statement! My WW shows my preschooler’s eclectic dress sense. I console myself that at least she is independent! Lorenzo loves orange. I went to the children’s second hand store and bought him three orange shirts and a pair of orange shorts for $10 because it’s a simple enough way to make him happy, I just won’t do laundry every single day. His feet look remarkably comfortable. Great choice.